The nut is placed at the end of the fingerboard and controls the strings spacing, distance from the outer edge of the fingerboard and their height above the first frets. Nuts can be made from a variety of materials and may require filing or replacement when making changes to the action, string gauge or wear and tear renders the slots too low. 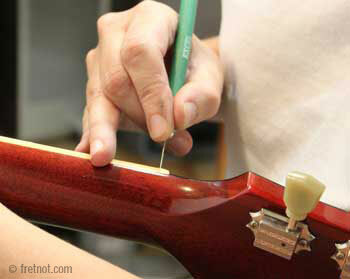 Many manufacturers install the nut on the neck prior to paint work. To reduce chipping of thick finishes I score the paint around the edges of the nut and across the peghead with a fresh x-acto blade before removal. Many manufacturers install the nut before the instrument is finished. To lessen the risk of chipping, the finish is scored prior to removal. Some guitar nuts are very easy to remove. Using a block to distribute the impact, a small tap of the hammer will pop them loose if they do not sit in a channel. However, it is a different story when the nut sits in a channel. These have support from the peghead and fingerboard. Trying to tap these forward could damage the peghead veneer and nut. Nuts that sit in a channel can be removed in a number of ways, depending on what technique best suits the situation. Tapping the nut sideways can loosen it to the point that it can be removed by hand. Griping the nut with end nippers is another option but it is not without risk. I protect the finish from tool marks and have a special pair of nippers with blunt ends. This helps reduce the chance of cutting into the nut and breaking it. Some nuts have been glued in a very tight channel using un-necessarily strong adhesives, this makes them very difficult if not impossible to remove in one piece. When this is the case it is sometimes necessary to cut a relief kerf in front of the nut (.008 slot) so that it may be tapped forward and loosened. The minor relief slot is then filled by making the new nut slightly larger. Under some of the most difficult circumstances, the nut must be sawn in half and literally collapsed in order to remove. This is done to avoid damaging the nut slot or peghead. If a nut pops loose I recommend using a couple of drops of Elmer's or wood glue to reattach it. The use of permanent adhesives can create problems should the nut need to be removed for future repairs. SHOP: Graph Tech Tusq Nuts for Fender, Gibson, Epiphone and more. Ready made nuts are available for installation on many instruments, however, adjustments to the string's width and depth must still be made. Differences in fingerboard thickness and fret height require string slots to be properly cut after installation. Nuts are often made from scratch when a different material is desired or a ready made nut of appropriate size is not available. Most popular materials, such as Fossilized Walrus Ivory, is available in blanks that can be shaped into a nut. It is important to have the instrument set up properly prior to cutting the string depth in the nut. 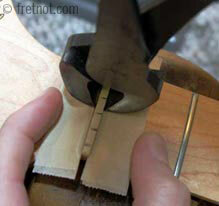 Cutting a slot too deeply will place the string against the first fret and result in buzzing. 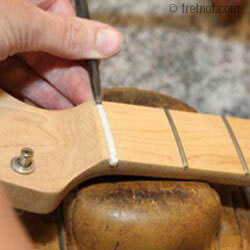 A nut that causes the open string to buzz must be replaced or shimmed to increase string height above the first fret. The depth of the slots in the nut determine how closely the string comes to the frets, particularly the first fret. It is critical that the string have ample room to vibrate without contacting the first fret or you'll have an annoying open string buzz. Adversely, nut slots that have not been cut properly can leave the strings higher than necessary above the first fret. This creates discomfort and higher action. A minor adjustment (say .020) can make a very noticeable difference. High action at the nut also sharpens intonation. When changing string gauges, an increase in string diameter sometimes require an adjustment to the slots width. On instruments with minimal peghead angle the angle is especially critical for a clear, clean sound. A poorly angled nut slot can create a jingly, buzz sound that can often be silenced if downward pressure is applied to the string behind the nut (over the peghead). This is often a sign that the string is not contacting the nut slot properly. The sound very closely mimics the sound of the string hitting the first fret when the slot is too deep. Strings that are too high at the nut are often the cause of poor intonation. Once the slots have been deepened I may remove material from the top of the nut, if need be, to avoid having the strings deeply buried in the nut. I want the slots deep enough to keep the strings from popping out when plucked but not so deep that they're buried. There are good reason's to salvage an original nut if possible. First of all vintage instruments often have lovely ivory and ebony nuts that are just too nice to scrap. And of course, it is cheaper, especially if you have an instrument for which no pre-made plastic nut is available. Making a bone nut for a $100 guitar would not make much sense. A good indication that the nut slots are cut/worn too low is strings that buzz only when played open (un-fretted). Shims are placed beneath the nut and are often destroyed if the nut is ever removed again. I have seen the made from wood veneer, paper even pieces of credit cards. In my opinion, they look awful. When laminating material to the base of the nut it becomes permanent and more difficult to see. The nut can then be removed just as any other without having to make a new shim. Friction can cause tuning issues and a pinging sound when tuning. Some materials have an inherent tendency to cause friction and treating these with graphite can reduce the friction. An obvious source for graphite would be pencil lead. A mechanical pencil can be used to line the nut slots with graphite to help reduce friction. I tend to favor white graphite as it doesn't made such a mess. run in same direction of string. 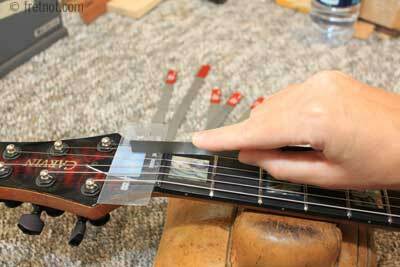 Locking nuts, like locking tuners, clamp down on the string to ensure it does not slip. Once the allen head is slightly loosened strings can be removed. String height is adjusted by adding shims between the base plate and neck. To be quite honest I have never been a big fan of roller nuts. They are made for use with one string gauge. Shims beneath the nut are used to adjust string height but no individual string height or width adjustment is possible. Bone nuts are dense, durable and often add sustain and clarity. All bone and ivory nuts are carved from scratch to fit the instrument in hand. Tusq® is the brand name of a man made material quickly gaining in popularity. Tusq® nuts and saddles are used by Taylor®, Gibson®, Tacoma® and many other manufacturers. These would be my recommendation for those seeking a ready made replacement nut. Graphite nuts are popular on electric guitars, especially those with tremolos. They help prevent string binding and provide a slick surface for the string to slide on. While these are standard on many factory instruments it should be said that there is a vast difference amongst plastics. Hollow, soft or spongy plastic nuts are sure to be a sustain and tone killer! These are metal, manufactured nuts found on electric guitars which clamp down on the strings, preventing string slippage. Used on electric guitars with tremolos, ball bearings ease the movement of the string across the nut. Made for use with one string gauge. Corian often has a very bright white appearance and is used on nearly all Martin® guitars. Corian is non-porous and dense make it a good choice for nuts. These use to be very popular but have lost the appeal, they are known for their brightness.